This sulfur was spotted on Deerweed (Acmispon glaber) at the Claremont Colleges' Robert J. Bernard Field Station. After studying the BugGuide photos and information for Sulfurs, I can only conclude that I'm certain that I can't reliably tell them apart, so any information will be greatly appreciated! posted on BugGuide, since they are so common in southern California; so, I went looking through the other species to see if any are hiding. 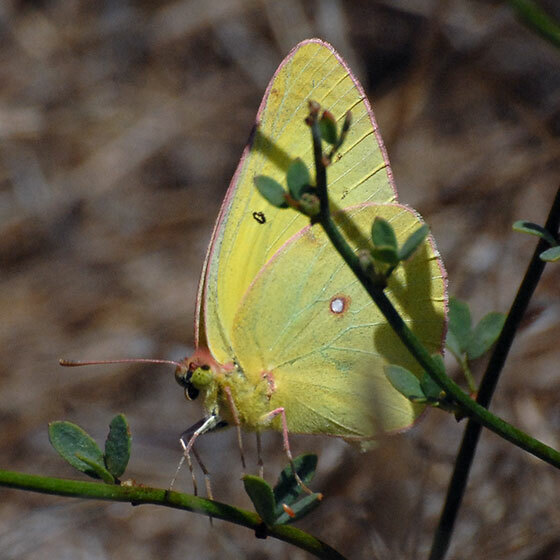 This one looks like it is indeed a male Colias harfordii. that I had at least one of those sitting in a file. Thanks so much! It’s great that someone keeps an eye out for these things. Colias harfordii will be a new addition to our field station invert list. I had been wondering just lately if it was there, and it turns out that we already have a photo. Moved from Butterflies (excluding skippers). Thanks, Hartmut! That certainly seemed the most likely. Colias eurytheme is already on the field station invert list, but it will be nice to add a photo.